I would appreciate some feedback for a fictional l brand I devised. so basically, the company creates fresh, authentic Italian food for people who are looking for something quick to eat, but aren't willing to sacrifice quality. Therefore, I'm aiming for a logo that gives a real rustic and homely feel when viewed. Despite the scarce information in the question about the concept and the total absence of the logo realization process, it presents some formal details that may need solution. 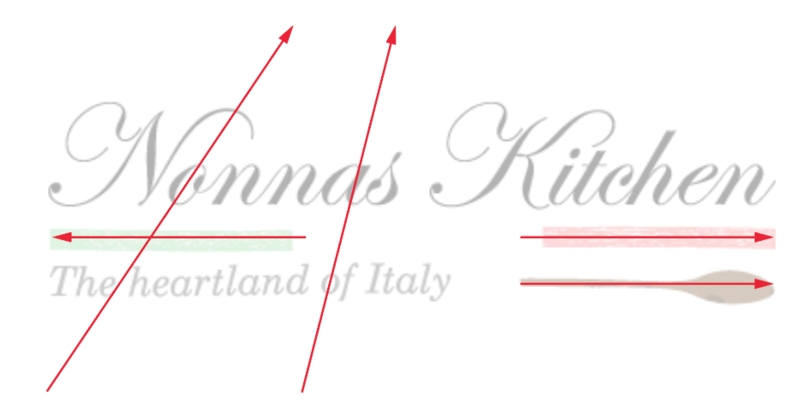 The combination of a calligraphic font with an italic is never recommended, since it's nearly impossible to find two different families fonts with the same directional axis. On the contrary, the contrast with a normal regular font is preferable. In addition to the two fonts, there are two other different graphic styles. Four elements to unify in a logo. This added to four formally different elements harms his visual unity. Personally I think that there are four elements placed in a random way without any sense, which makes it difficult to try to create a unique image, a logo. So the only vertical alignment axes are the left and right edge, the rest is chaos, no vertical axis matches. It's quality a British calligraphic wedding font? It's rustic an imperceptible graphic treatment? It's home feel a bad made pictogram of a wooden spoon? I don't find it rustic or homely. Looks to me like you wen't more for elegant. I also think you're trying to put to much into it. I realize it's a flag, but the white sort of melts into the background so it just looks like two colored rectangles on each side. Add to that the spoon and the slogan, I think it's a bit too much for a logo. I would take away either the spoon and center the slogan or take away the flag. A logo needs to be more cohesive, like one solid thing. Also Scott's right, there should be an apostrophe in "Nonna's".